In Gettysburg, one of the perks of a beautiful sunny day is being able to enjoy a meal outside. At many of our restaurants, you can dine outside while people watching at Lincoln Square or while taking in views overlooking historic battlegrounds. We’ve compiled a list of places for outdoor dining in historic Gettysburg, Pennsylvania. The Pike Restaurant & Tap House has a beautiful covered deck for outdoor dining. It is pet friendly and conveniently located just a few minutes from the Gettysburg National Military Park Museum & Visitor Center on Baltimore Pike. The Pike also boasts of having the largest craft beer selection in Adams County. Located on the site of one of the earliest houses in Gettysburg, The Gettysburger Company has its own fascinating history as well as scrumptious food. Dig into one of The Gettysburger’s fresh, gourmet burgers, made from beef from a local farm. Or, sip on one of their decadent spiked milkshakes while you relax at their outdoor seating and watch shoppers stroll down Chambersburg Street. If some of your obsessions in life include beer, burgers and the Gettysburg Battlefield, the Appalachian Brewing Co. (ABC) Battlefield Location is the place for you. Sit in their outdoor patio or in the beer garden adjacent to the battlefield on Steinwehr Avenue and indulge in an ABC juicy burger and craft beer. For your convenience, you can even order your beer from the outdoor beer and soda window right in the beer garden. Every town has that trendy coffee shop where the locals go to relax, have a snack and sip on a cup of coffee. In Gettysburg, that place is Ragged Edge Coffeehouse on Chambersburg Street. Although the inside of Ragged Edge is filled with beautiful artwork, on the warmer days it’s nice to make your way outdoors to the garden, a beautiful oasis right in the heart of Gettysburg. Located in the heart of Downtown Gettysburg on Lincoln Square, The Pub & Restaurant offers prime seating for people watching and taking in the hustle and bustle of town. During the summer, the outdoor patio is open for those who wish to soak in as much sunshine as they can. The atmosphere and mouth-watering meals at The Pub will have you coming back for more! Dine alongside waterfalls and a gorgeous garden at the Farnsworth House Inn Restaurant and Sweney’s Tavern. Beautiful trees offer shade to the dining area and home to a variety of birds that fill the garden with their songs. On the weekends, you can enjoy live entertainment from the beer garden. Step right off of Baltimore Street into this stunning sanctuary. If you’re shopping in Lincoln Square and are looking for a place to stop and eat, One Lincoln Food & Spirits is a tasty and convenient option. The menu offers both traditional and healthy choices, all equally delicious. For those who live in Gettysburg or visit every year, it’s always a sign that spring is here when the laughter of those dining outdoors at One Lincoln fills the air in Lincoln Square. Time and time again we hear that a visit to Gettysburg isn’t complete without a stop at Tommy’s Pizza, Inc. located on Steinwehr Avenue. Tommy’s serves pizzas, subs, salads and an impressive selection of craft beer – all of which can be enjoyed outside. If you’ve ever wondered how Tommy’s makes their pizza SO delicious, check out our Cooking with a Gettysburg Chef segment at Tommy’s. Although dining inside of the historic Dobbin House Tavern is an amazing experience, dining outdoors offers a different option. Located on Steinwehr Avenue, you have a perfect outlook of the town’s activity as well as a more casual atmosphere than inside the house’s dining room. This summer give it a try and see which you prefer! If you’re looking for a place to let loose, have a couple of drinks and have a good time, head to The Livery on Chambersburg Road. You can enjoy great food and a great atmosphere on their outdoor deck or patio. Inside you’ll find pool tables, foosball and a touch screen video game! Sharpshooters is a popular spot for motorcyclists to park their bike and grab a quick bite as well. Check out our website for more outdoor dining options. And let us know, where do you like to dine outside in Gettysburg? The Mexican Restaurant, El Costenzo, on York St. is outdoor too. Excellent! Another great spot for outdoor dining! and Fidler & Co Craft Kitchen in Biglerville has a lovely, intimate, partially-shaded outdoor seating area, as well! They are both great places as well! DO ANY ALLOW YOU TO HAVE YOUR PETS SIT QUIETLY WITH YOU WHILE YOU ARE EATING OUTDOORS? Cathy, yes! Many of the restaurants allow pets in the outdoor seating area. We recommend calling the specific restaurant ahead of time to be sure. 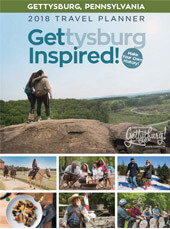 If you are interested in other dog-friendly ideas in Gettysburg, check out our “Dog-Tripping in Gettysburg” post – https://roadtogettysburg.com/dog-tripping-gettysburg-pa/. O’Rorke’s is another beautiful spot to enjoy a meal outside! We enjoy sitting outside at O’rouke’s. Great location and food! We love O’Rorke’s! Another great spot for outdoor dining! Agreed! O’Rourkes is a fantastic place for a bite to eat and they have the absolute best Bloody Mary’s. (Anyone familiar with bacon flavored vodka? ) Delicious!